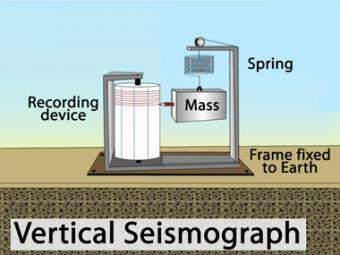 How do seismometers measure vertical ground motion? 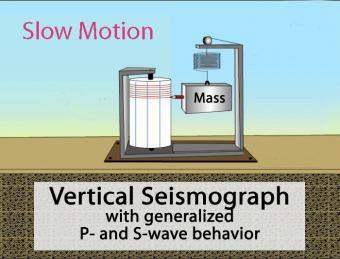 Animation of the principles of a drum-style vertical seismograph station that records up-and-down movement. 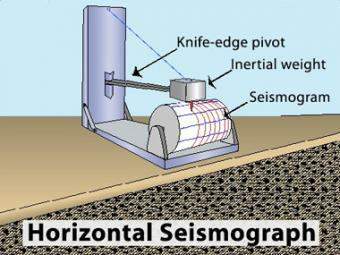 Seismographs are designed so that slight earth vibrations move the instrument. The suspended mass remains at rest as the spring absorbs some of the motion. The stylus (pen) affixed to the mass, records the relative motion between itself and the rest of the instrument, thus recording the ground motion. Animation shows compressive behavior of the P wave in the direction the wave is traveling and the shearing behavior of the S wave perpendicular to the direction of wave travel. Although the arrow shows gross movement, remember that this happens on a microscopic scale in the Earth. Drum-style vertical seismograph station records up-and-down movement. he suspended mass remains at rest as the spring absorbs some of the motion. The stylus (pen) affixed to the mass, records the relative motion between itself and the rest of the instrument, thus recording the ground motion. 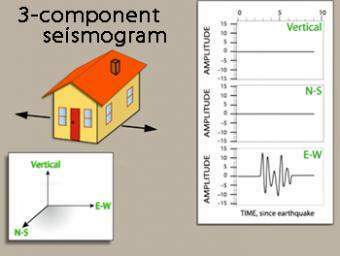 We use exaggerated motion of a building (seismic station) to show how the ground moves during an earthquake, and why it is important to measure seismic waves using 3 components: vertical, N-S, and E-W. Before showing an actual distant earthquake, we break down the three axes of movement to clarify the 3 seismograms. 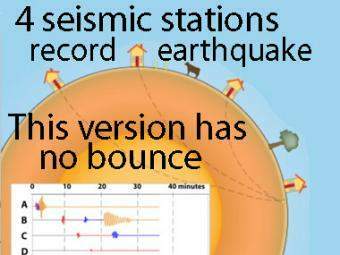 A cow and a tree in this narrated cartoon for fun and to emphasize that seismic waves traveling away from an earthquake occur everywhere, not just at seismic stations A, B, C, and D. A person would feel a large earthquake only at station A near the epicenter. 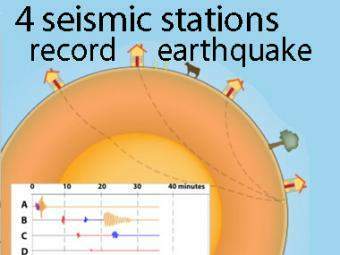 Stations B, C, D, and the cow are too far from the earthquake to feel the seismic waves though sensitive equipment records their arrival. 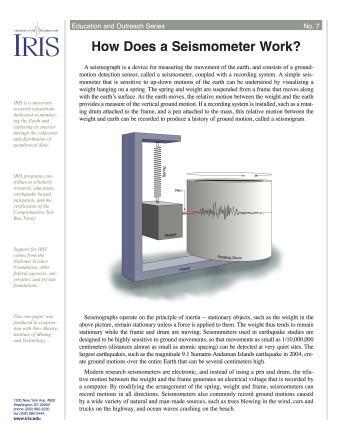 This companion to the animation "Four-Station Seismograph network" shows the arrival of seismic waves through select wave paths through the Earth (P and S waves) and over the surface of the Earth. The movement at distant stations occurs at a microscopic scale. 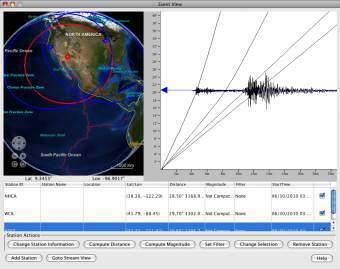 While that doesn't result in noticeable movements of the buildings, the arrivals are recorded on sensitive seismometers.